Years ago, I read a story about golf. The only reason I remember this particular article is that I eventually found myself at the end of it, a surprise because my interest in golf is roughly the same as my interest in illustrated medieval manuscripts. I can see why other people are intrigued, but I have no desire to follow suit. The story — by gifted Washington Post writer Thomas Boswell — made something interesting out of something that fails to make my meter race. I felt the same way about The Damned United, a movie that takes place in the rough-and-tumble world of British football, known to us Yanks as soccer. I have no pressing interest in soccer, but found myself caught up in a story that uses professional soccer as an arena in which to examine what happens when a rising star overestimates his abilities. The resultant kick toward reality may be predictable, but the way in which its developed proves entertaining and revealing, thanks in part to some wonderful British actors and to a script that reflects a deep understanding of the human capacity for hubris. I don’t know whether Peter Morgan’s screenplay — based on a novel by David Peace — is entirely accurate, but the movie’s take on the combustible combination of ego and big-time sports certainly rings true. 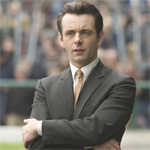 The Damned United focuses on real-life coach Brian Clough (Michael Sheen), who became a British media star, so much so that he audaciously compared himself to Muhammad Ali. Clough, who died in 2004, saw himself as a man who could do no wrong when it came to soccer, and — for a time — he justified every bit of his brazen self-regard. In short, he won soccer matches. It’s no surprise that Sheen proves perfectly matched with the role of a smooth operator who’s forced to learn the limits of his talent. The actor did equally strong work in The Queen and Frost/Nixon, movies Morgan also wrote. Director Tom Hooper, who mostly has plied his trade in television, follows a career in which the youthful Clough is taken down a peg or two. In what I’d deem a brilliant move, Hooper concludes before Coach Clough earns his reputation as one of the greatest managers in British football history. Hooper must have understood the time-tested axiom: Failure generally proves a better teacher than triumph. The story begins in familiar fashion. Clough kicks off his career by making a name for himself in the British backwaters. Jim Broadbent — does this guy ever hit a false note? — portrays the owner of Derby County, the team with which Clough’s rise to stardom begins. Broadbent plays a puffed-up managerial type, which means he doesn’t like to spend money. He’s ultimately bested by Clough, who insists on doing things his way. Based on his success with Derby County, Clough was hired in 1974 to coach Leeds United, a glamor team with a phenomenal record. Former Leeds coach Don Revie (Colm Meaney) had moved on, taking command of the British national team. Clough lived to surpass Revie, whom he regarded as a man who encouraged the kind of dirty play that undermined the game’s elegance. Clough might have fared better had he not moved to Leeds without the help of assistant Peter Taylor (Timothy Spall). Taylor, we learn, played a major role in Clough’s success. Taylor lacked the flash that turned Clough into a celebrity, but he had an unfailing eye for talent. Left to his own devices, Clough never was able to take control of the Leeds team. His career sputtered. The D amned United is as involving a sports movie as I’ve seen in a long time, not because it shows us great soccer footage, but because it helps us understand the intricacies of character that drive men who try to prosper in the pressure-cooker environment of professional sports. This is one sports movie in which most of the sweating occurs off the field.